The path shows the interpolated position of the object through world space during the scene animation. By default, the path is sampled at integer frames. You can increase the path sampling in the handle settings to get a smoother path at the cost of performance. Ticks (small lines perpendicular to the path) show where the motion path is at each frame. (You can turn the frame ticks off in the settings.) Every fifth tick is slightly longer to make it easier to visually count frames. 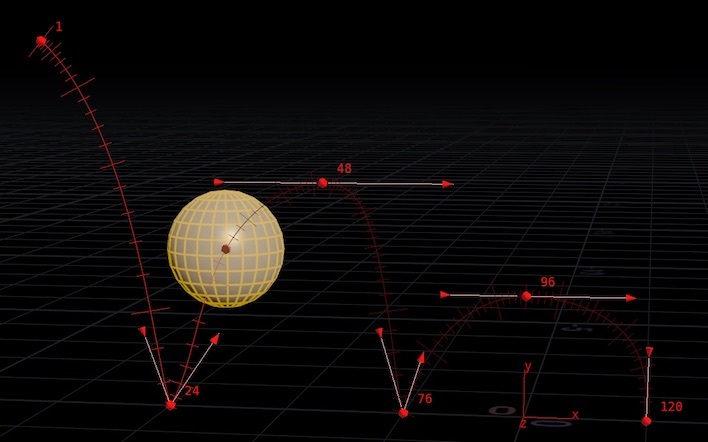 Spheres on the path show keyframes. You can click or drag a sphere to move it in world space. You can display tangent handles on keyframes to let you edit the in and out tangents for keys and see the changes in the path. Click the Pose tool in the toolbox to left of the 3D viewer. Select the object you want to show the motion path for. In the operation control toolbar across the top of the viewer, turn on Motion path, or press ⇧ Shift + A.
Right-click the motion path and turn on Persistent. Click a keyframe dot to show a transform handle. This lets you adjust the keyframed position in world space. You can show handles to adjust the in and out tangents of the keyframes. Right-click the motion path and turn on Show tangents, or turn them on in the handle settings. ⌃ Ctrl + on the path to insert a keyframe where you click. ⌃ Ctrl + ⇧ Shift + on a keyframe to delete the keyframe. Right-click the motion path and turn on Handle parameters. Then click the Handle color swatch. Changing the color makes it easier to tell different motion paths apart when you have multiple persistent handles. Right-click the motion path and turn on Handle parameters. 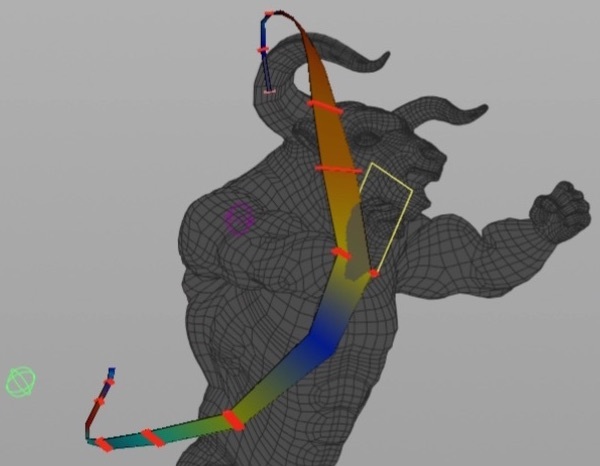 The color Houdini uses to draw the motion path handle. Click the color swatch to open a color picker. 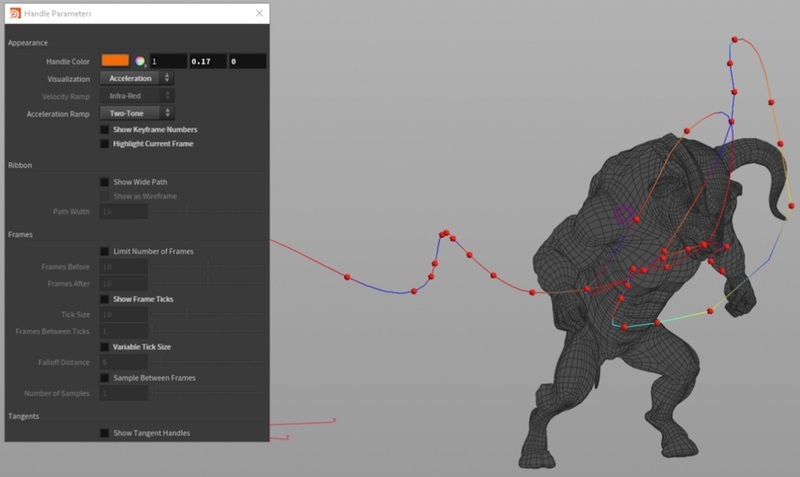 Controls how Houdini draws the motion path. Draw the path in a solid color. Draw the path before the current frame bright and the path after the current frame using different shades. 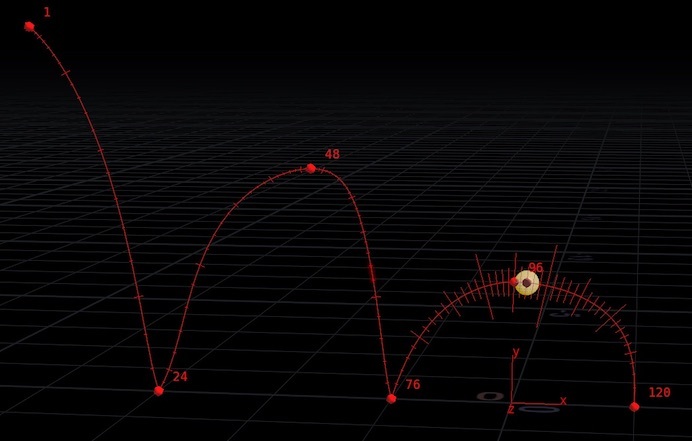 Color the path using a ramp to visualize the object’s velocity at each point. Color the path using a ramp to visualize the object’s acceleration at each point. You can change the visualization quickly by right-clicking the path handle and choosing an option from the menu. When Visualization is Velocity, this lets you choose a preset color ramp to use to visualize velocity as color. When Visualization is Acceleration, this lets you choose a preset color ramp to use to visualize acceleration as color. Draw the path as a wide strip/ribbon instead of a line. This may be helpful for visualizing object roll/banking. Keyframes appear as bars across the ribbon. When Show wide path is on, this draws the path as a wireframe (that is, as two lines along the edges of the path) instead of as solid, allowing you to see through it. When When Show wide path is on, this controls the width of the path. Normally Houdini draws the entire path corresponding to the scene’s current frame range. You can turn this on to only draw the path for a certain number of frames before and a certain number of frames after the current frame. When Limit number of frames is on, only draw the path for this many frames before the current frame. When Limit number of frames is on, only draw the path for this many frames after the current frame. Show ticks on the path representing frames. If you have a very large number of ticks crowding together on the path, you can choose to only show a tick for only every second frame, or third frame, or nth frame, using the Frames between ticks setting below. Controls how long the ticks marks are. Increase this to make the tick marks more visible. You can also use the Variable tick size setting to dynamically emphasize the ticks near the current frame and de-emphasize ticks away from the current frame. The default value of 1 shows a tick for every frame. If you have a very large number of ticks crowding together on the path, you can use 2 to only show a tick for every second frame, or 3 to only show a tick for every third frame, and so on. Turn this on to dynamically increase the size of ticks near the current frame, and decrease the size of ticks away from the current frame. In certain circumstances this might make the handle less likely to obscure other geometry. 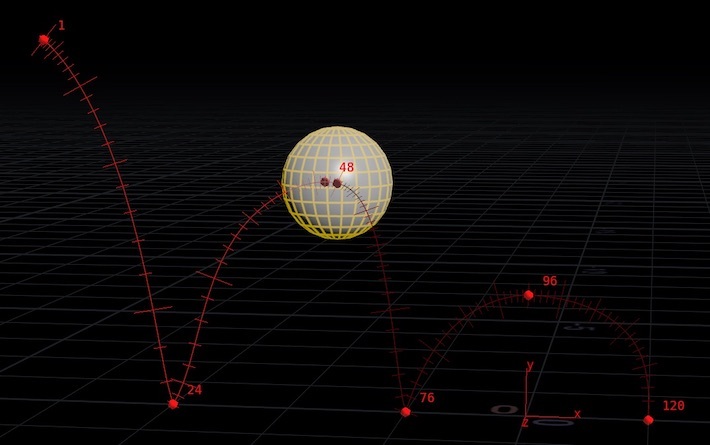 When Variable tick size is on, this controls how quickly the ticks decrease in size the further they are from the current frame on the motion path. Decreasing this setting causes the tick length to decrease over a shorter distance, so long ticks near the current frame quickly fall off. Increasing this setting stretches the falloff over a greater distance, so long ticks near the current frame slowly decrease along the path. Normally, Houdini draws the path using straight line segments between the object’s position at each integer keyframe. Sometimes you might want to sample a smoother line, to capture very quick motion or visualize the effect of tangent changes better. You can turn this setting on and increase the Number of samples parameter to sample at times between frames. However, turning this on can make displaying and manipulating the motion path handle slower. When Sample between frames is on, this is the number of samples to take for each frame of animation. The default value of 1 samples at each frame, the same as when Sample between frames is off. A value of 2 would sample at the frame and halfway to the next frame. A value of 3 would sample at each frame and 1/3 and 2/3 of the way to the next frame, and so on. At each keyframe, show tangent handles to let you adjust the in and out tangent directions and speed visually in world space. You can show or hide the tangent handles quickly by right-clicking the path handle and choosing Show tangents from the menu.